How to wear your ZeoT Zürich hip scarf with style! HOW TO WEAR YOUR ZEOT ZURICH HIP SCARF WITH STYLE! We’re really enjoying wearing our new ZeoT hip scarves in class! Sustainably produced for us in Zürich by Social Fabric, the hip scarves allow great range of movement when dancing and are light and comfortable to wear. Check out our ideas below on how to wear your hip scarf with style! 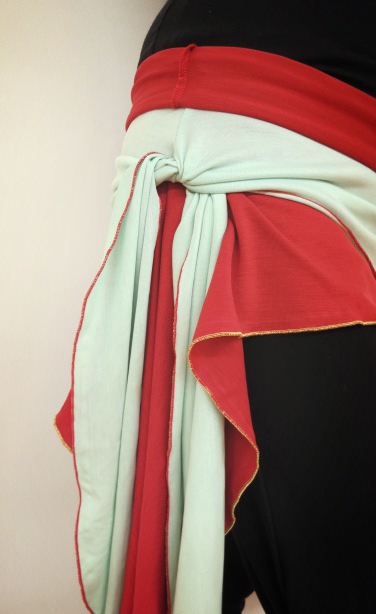 Tie a folded silk scarf on top of your hip scarf around your hips, in a matching colour to draw out the colour of the stitching. Wear two hip scarves together! At hip level, fold over the edge of the scarf worn underneath (in the picture the red scarf) and tie a knot in the hip scarf worn on top (in the picture the peppermint scarf) just on one side for an asymmetrical look! Works best with contrasting colours. Wear two hip scarves in contrasting colours and knot the two hip scarves together at the side or combine your hip scarf with a beaded or sequinned belt on top. Hip scarves are not just for your hips! Use as a beautiful light weight shawl on a summer’s evening or during stretching if you feel chilly! Get yours now through our online shop! A big thanks to Lhamo for modelling the hip scarves and for the ideas.